32 years ago - Drury Walker is born. 12 years ago - 20-year-old Drury first becomes Killer Moth in an effort to earn Carmine Falcone's bounty on Batman. He takes hostages, but is stopped by Batgirl. ​11 years ago - 21-year-old Drury escapes from Arkham along with Julian Gregory Day, and joins Roman Sionis's organization. 6 years ago - 26-year-old Drury attempts a comeback but is stopped with little effort by Batman. 3 years ago - 29-year-old Drury escapes from Arkham, but he is stopped by the GCPD. There are a lot of fun old fashioned bad-guiys in the echelons of comics that really have no functional explanation other than that the writers needed a gimic for the next issue and were under a deadline. Sometimes they were weird because they don't translate very well out of the era they were created, like the Penguin. Others are just genuinely ludacrious ideas, like Calendar Man. Still, if these characters are aound long enough eventually someone will figure out a way to take them and make them compelling. The Killer Moth might actually be an outlier to that whole idea. His original concept wasn't that bad, really... it just happened in the middle od an era when character creation literally had no standards to meet. Striped leggings and butterfly wings actually constituted a costume. As years passed we seem to have decided, for whatever reason that this weird classic character is going to be THE weird classic character. The whole charm of Killer Moth is that he literally has no business being there, and he's the last to know that. A character like this can only exist in an enviornment so creatively lush that even the bad ideas sometimes wind up being good. 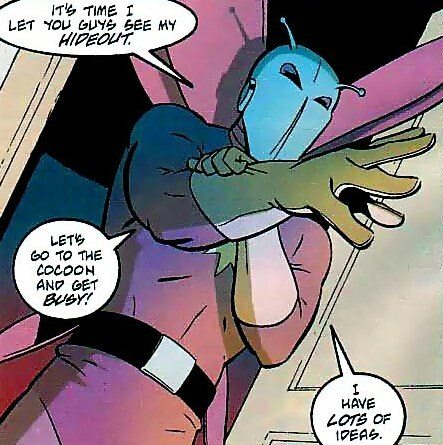 Over the years, Killer Moth would basically be back and forth between his 'anti-batman' idiom and just being another wackadoodle themed thief character like Poka-dot Man of the Condiment King. It's a weird position to be in... he was basically the most popular character on the list of the absolute worst characters. I'm not sure what it says about DC's expectations for Barbara Gordon's Batgirl when they chose Killer Moth as her very first bad guy, but probably nothing good. 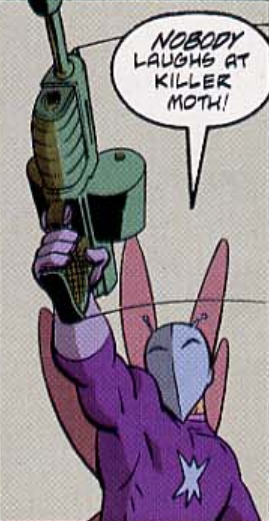 In the meantime, however, a lot of outside media started to use Killer Moth allegories when they wanted to create a fun reference to the classic wacky comic villain. When a good writer gets their hands on Killer Moth they can use him as a very clever little bit of self-referential fun. The fact that Killer Moth persists to this day as a character is a bit of a puzzle. There are a huge number of goofball characters that have turned up over the years in Batman comics, and for the most part they've either been updated into more dangerous sinister variants, or they've been forgotten. It's only the rare few that seem to be at their best when they embrace their own siliness, and of those, Killer Moth might be the only one that still gets used as an actual badguy. The likeliest explanation is that he has a cool name. "Killer Moth" just sounds cool. In addition, he's perhaps one of the only Batman villains to have gone through the late seventies and early eighties and never be re-imagined with a new more violent schtick. There were ATTEMPTS obviously, but none of them really stuck, and in the end the character is the most fun when he's just a weird guy staging one-man bank robberies in Gotham; trying to outwit Batman, failing every time, and yet still thinking he's due a win. We tied Drury into the larger organized crime families in Gotham, because it did a better job of framing his story and giving him a place in the world, even if that place is kinda funny. This is actually a weirdly tricky subject, because if you're going to get Killer Moth right... he actually needs to look kind of rediculous. Unlike literally every other Batman villain ever, this guy has somehow thrived by embracing the general goofiness of his concept. So you want the weird mask, the fur accents, the wings, the colorful striped leggings... this is a character that is completely convinced of his own effectiveness and blind to his own f-list status. He's had his look updated a few times, most notably during the 'Underworld Unleashed' storyline when he was was among a group of supervillains that all had their powers enhanced by DC's equivelent of Satan; Neron. He became an actual anthromorphized moth named Charaxes... but the main appeal of this character is his name, so obviously that didn't stick, and the classic weirdo costume returned. There was actually another costume redesign recently and it's at least worth bringing up. 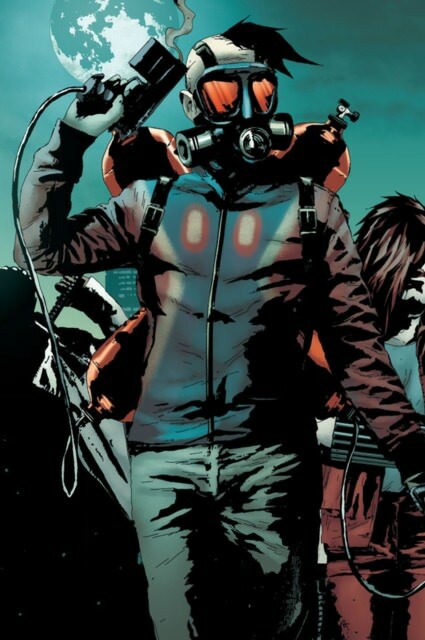 In the new 52 he appeared with an entirely new costume... something with prominant tanks on his pack and a half-shaved head. Evidentally this take on the character wasn't even Drury Walker; it was just an attempt to invent a new villain and slap a classic name on him. Still, it wasn't a bad look. Killer Moth is a clear anarcronism... a holdover from a bygone era. The idea that he persists even to this day is a conceit we 're all choosing to make collectively juist as a fun way to honor what's come before. The upshot of that, of course is that if he only continues to exist as a riff on classic comics that we're all allowing to happen then there's no reason he can't CONTINUE to exist as we move into the future of comics. In fact, I actually image a future when Drury Walker, through no effort of his own, actually becomes something of a major supervillain. It's not hard to picture what that might look like (I imagine the Monarch from Venture Brothers is a good model to follow), Especially if he somehow has some sort of major windfall that leaves him incredibly wealthy and having access to a plethora of high-tech weaponry that he has no clue how to use properly. Henchman and a lair are sure to follow, making him an absolutely hilarious addition to comics moving forward.